Scrap Metal Recycling - James G. Grant Co. If you’re a business or organization looking for scrap metal recycling for the surrounding communities of central and eastern Massachusetts, give us a call at James G. Grant Co. As a scrap metal recycling facility, we have been an industry leader for the past six decades. And while our business may date back to the1960s, our scrap metal recycling facilities are state-of-the-art. A new, sophisticated computer system for scrap metal recycling accurately weighs each load of discarded metal for scrap metal recycling, including steel, copper, brass, iron and other metals and alloys and then pays cash or will credit your account on our onsite ATM. The credit you receive for scrap metal recycling can then be used when you dump waste in the C+D Transfer station. Saving energy Extracting metals from ore is very energy-intensive. By comparison, recycling scrap metal can drastically reduce energy consumption. Conserving resources There is a limited amount of ore on the planet, and scrap metal recycling is crucial to preserving this. Recycling a ton of steel conserves 2,500 pounds of iron ore, as well as 1,400 pounds of coal and 120 pounds of limestone. Preventing waste The majority of metal we use today has already been recycled at least once. That’s a significant amount of metal which would have otherwise been headed for the incinerator or landfill sites. 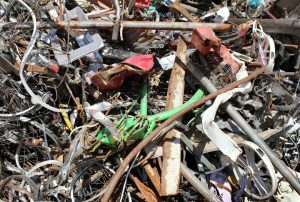 Reducing pollution According to a report by The Institute of Scrap Recycling Industries, recycling scrap metal instead of mining for it and smelting it may cut greenhouse gas emissions by as much as 500 million tons. Boosting the economy The US scrap industry employs around half a million workers, and thanks to the demand for scrap metal, the industry generates over $100 billion a year. Demolition asset recovery provides much of the available scrap metal in the US. If you have access to scrap metal through your business, contact the scrap metal recycling experts here at James G. Grant Co. and learn more about how you can benefit from recycling it and help the environment, too.